Global intelligent virtual assistant market expected to reach USD 19.6 billion globally by 2025, at a CAGR of 35.4% between 2019 and 2025. The global intelligent virtual assistant market is likely to be driven by the increasing use of smart speakers for residential applications in the future. The report analyzes and forecasts the intelligent virtual assistant market on a global and regional level. The study offers historical data for 2016, 2017, and 2018 along with forecast from 2019 to 2025 based on revenue (USD Billion). The assessment of intelligent virtual assistant market dynamics gives a brief insight into the drivers and restraints for the intelligent virtual assistant market along with the impact they have on the demand over the years to come. Additionally, the report also includes the study of opportunities available in the intelligent virtual assistant market on a global level. The report gives a transparent view of the intelligent virtual assistant market. We have included a detailed competitive scenario and portfolio of leading vendors operating in the intelligent virtual assistant market. To understand the competitive landscape in the intelligent virtual assistant market, an analysis of Porter’s Five Forces model for the market has also been included. The study encompasses a market attractiveness analysis, wherein all the segments are benchmarked based on their market size, growth rate, and general attractiveness. 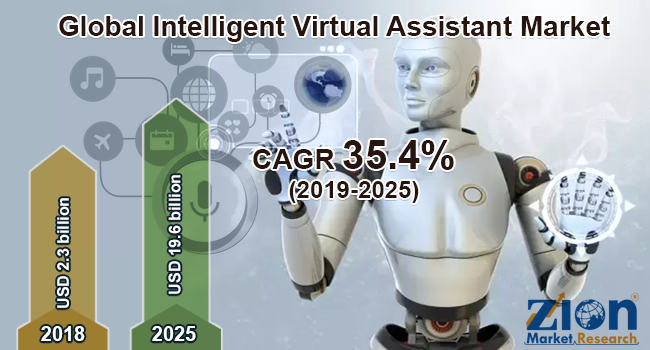 The study provides a crucial view of the intelligent virtual assistant market by segmenting the market based on technology, application, end-use, industry vertical, and region. All the segments of the intelligent virtual assistant market have been analyzed based on present and future trends and the market is estimated from 2019 to 2025. Based on technology, the global intelligent virtual assistant market is segmented into text-to-speech and speech recognition. Chatbots and smart speakers form the application segment of the global intelligent virtual assistant market. Private and commercial sectors comprise the end-use segment of the intelligent virtual assistant market. The industry vertical segment includes retail, BFSI, automotive, travel and tourism, government sector, and others. The regional segmentation comprises the current and forecast demand for the Middle East and Africa, North America, Asia Pacific, Latin America, and Europe of the intelligent virtual assistant market with further division into the U.S., Canada, Mexico, UK, France, Germany, China, Japan, India, South Korea, Brazil, and Argentina, among others. Some key players of the global intelligent virtual assistant market include Microsoft Corporation, Alphabet Inc., Apple Inc., Nuance Communications Inc., Next IT Corporation, IBM Corporation, Amazon, Inc., eGain Communications Corp., Artificial Solutions Ltd., and Speaktoit Inc., among others.